BareBones provided a late-Summer residency in visual and spectacle arts at TCHDC’s Liberty Plaza housing development in St. Paul, MN. Resident youth enrolled in the Summer Program at the Liberty Plaza Resource Center spent the first two weeks of August at Excursions Into High Art learning three different kinds of “high arts”. 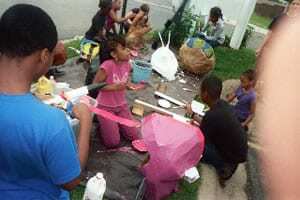 Participants made papier-mache pole puppets, built and launched solid-engine model rockets, and learned to stilt. BareBones provided a two-week June residency in visual, construction, and parade arts at TCHDC’s Calibre Ridge Resource Center in Roseville, MN. Participants made papier-mache pole puppets, built and launched solid engine model rockets, and practiced stilt walking. 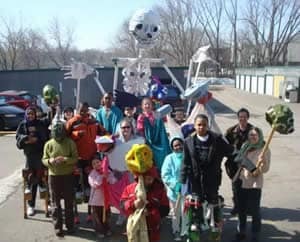 On the last Friday, everyone joined in a community parade that showcased their puppetry, stilting, and parading skills. Resident youth at Garden View Apartments spent their Spring Break doing Excursions into High Art. 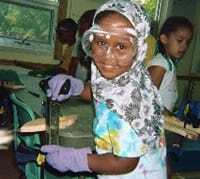 Participants created pole puppets, designed and launched soda bottle rockets, made stilts and practiced stilting. BareBones, in collaboration with Concordia University, facilitated a two-week visual and performing arts residency at the Liberty Plaza apartments of the Twin Cities Housing Development Corporation. 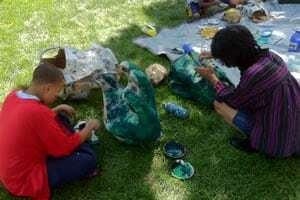 Participants from ages 5 – 14 created Vietnamese water puppets and papier-mache masks, and learned puppeteering and stilting for a walking parade and water puppet show that was held before an audience of family and neighbors. 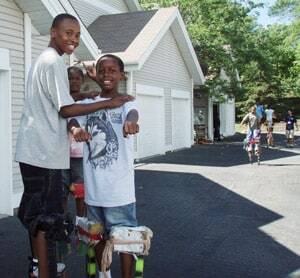 BareBones Productions, in collaboration with Campfire USA, recently completed a two-week visual and performing arts residency at the Calibre Ridge apartments of the Twin Cities Housing Development Corporation (TCHDC). The residency was held from June 14th – 25th, 2010. This was the 10th year that BareBones was contracted for this residency.